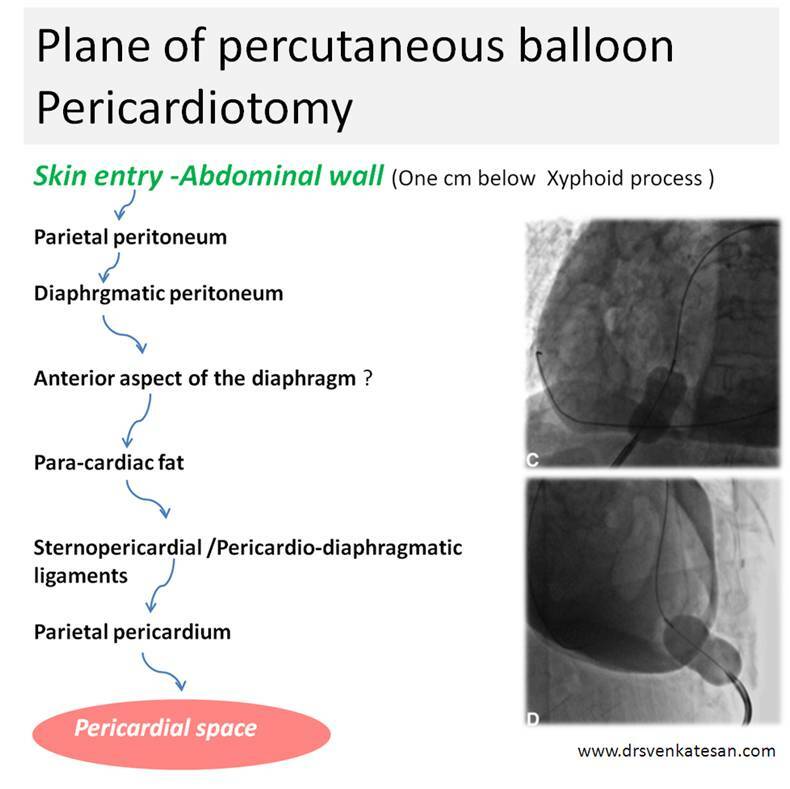 Percutaneous balloon pericardiotomy :What is the anatomical track ? Where does the fluid drain ? Balloon pericardiotomy is done as a drainage procedure in recurrent pericardial effusion. 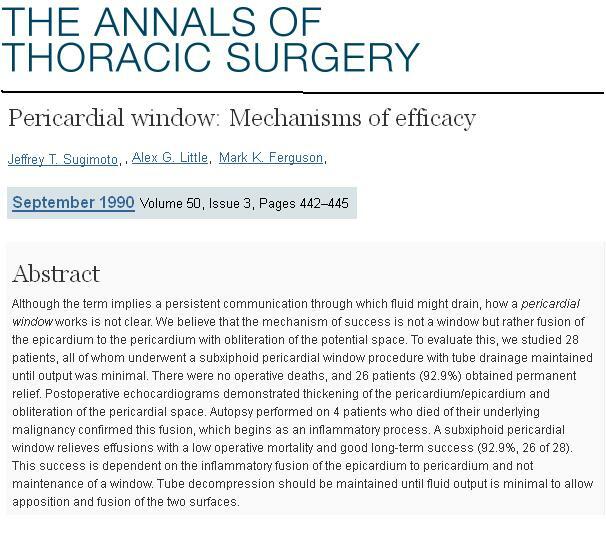 It is actually a replication of surgical pericardial window by Interventional cardiologist.The window not only drains the effusion , it also act as a continuous drain. Though the benefits are real (Pericardial fluid is shunted away from the pericardial space) the exact mechanism of its benefit is not clear . By concept , the catheter and balloon should not cross the pleural space , (As pneumothorax may ensue) but still pleural effusion is a common consequence of this procedure .How is this possible ? One probable explanation is, the pleural space has some hidden communication with pericardial space .The other possibility is that, balloon creates virtual tissue channels in the para-cardiac spaces of mediastinum .The extra-cardiac lymphatics does the drainage job without true shunting pericardial space into the pleural space.. The procedure carries a definite risk especially if done in an emergency fashion. The aim of procedure is two fold one to drain pericardial effusion second to prevent recurrence of effusion .Since procedure carries considerable risk its to be performed only in malignant effusion that are documented to be recurrent. Surgical window creation is well known procedure , ever since Palacios (Ref 1) in 1991 described this per cutaneous approach as an alternative to surgery has become less popular. The risk of anesthesia and co-morbidity makes balloon pericardiotomy attractive. But surgical window creation still may have a role. A video assisted pericardiotomy by thoracoscopy is also possible .Another option is injecting sclerosing agents into pericardial space .This time tested simple modality probably requires more attention. It should be realised this procedure may just shift the fluid from pericardium to pleural space. Some of them become significant effusion that requires pleural space drainage. Its a real issue , there has been instances of accelerated death after the procedure. Hence this procedure is a trade-of between patient comfort and quality of life with a potential risk of dissemination impacting the longevity of life . 1.Palacios IF, Tuzcu EM, Ziskind AA, Younger J, Block PC. Percoutaneous balloon pericardial window for patients with malignant pericardial effusion and tamponade. Cathet Cardiovasc Diagn 1991: 22;244-249. 4.Ziskind AA, Pearce AC, Lemon CC, Burstein S, Gimple LW, Herrmann HC, Mc Kay R, Block PC, Waldman H, Palacios IF. Percutaneous balloon pericardiotomy for the treatment of cardiac tamponade and large pericardial effusions: description of technique and report of the first 50 cases. J Am Coll Cardiol 1993; 21 (1): 1-5..